CAMBRIDGE, Mass. — For hundreds of millions of years, plants thrived in the Earth’s oceans, safe from harsh conditions found on land, such as drought and UV radiation. Then, roughly 450 million years ago, plants found a way to make the move to land: They evolved spores—small reproductive cells—and eventually pollen grains with tough, protective outer walls that could withstand the harsh conditions in the terrestrial environment until they could germinate and grow into a plant or fertilize an ovule. A key component of the walls is sporopollenin, a durable polymer — a large molecule made up of many small subunits — that is absent in algae but remains ubiquitous in all land plants to this day. Understanding the molecular composition of polymers found in nature is a fundamental pursuit of biology, with a long history tracing back to the early days of elucidating DNA and protein structures. However, the very toughness that makes sporopollenin so important for all land plants also makes it tough for researchers to study. It is extremely inert, resistant to reacting with other chemicals, including the ones researchers typically use to determine the structures of other plant biopolymers, such as polysaccharides, lignin, and natural rubber. Consequently, scientists have struggled for decades to figure out exactly what the sporopollenin polymer is made of. Now, in an article published in the journal Nature Plants on December 17, Whitehead Institute Member Jing-Ke Weng and first author and Weng lab postdoc Fu-Shuang Li, together with collaborators Professor Mei Hong and graduate student Pyae Phyo from the Massachusetts Institute of Technology (MIT) Department of Chemistry, have used innovative chemical degradation methods and state-of-the-art nuclear magnetic resonance (NMR) spectroscopy to determine the chemical structure of sporopollenin. In addition to solving a longstanding puzzle in plant chemistry, identifying the structure of sporopollenin opens the door for its potential use in a host of other applications. Sporopollenin’s inertness is a desirable attribute to replicate in the development of, for example, medical implants such as stents, which prop open clogged arteries, to prevent negative interactions between the device and the body. It could also be a good model for durable paints and coatings, such as those used on boats, where its inertness would prevent reactions with compounds in the water and so protect the ship’s hull from environmental degradation. Finding the shape and composition of sporopollenin was not a simple task. 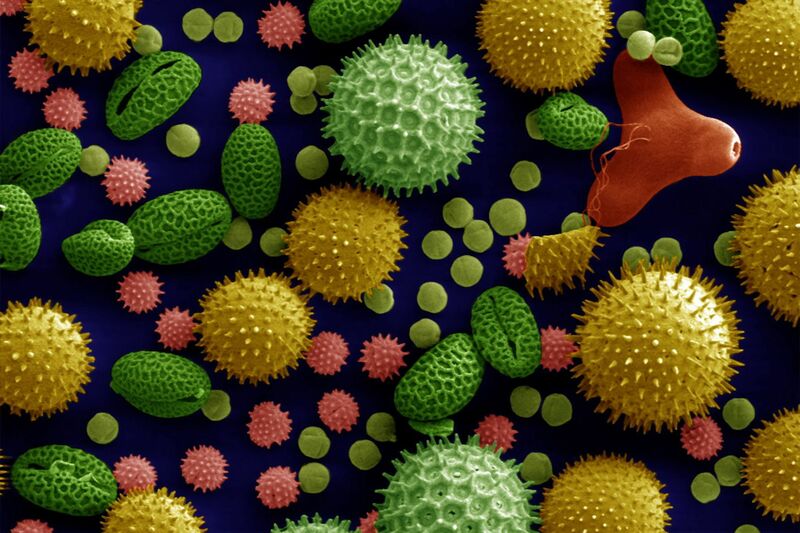 The first challenge was getting enough of the material to study, as pollen amounts that can be collected from most plants are minute. However, pollen from the pitch pine, Pinus rigida, is sold in bulk in China as a topping for rice cakes, so Weng used an unconventional sample collection method: He asked his parents in China to ship him copious quantities of pitch pine pollen. A common approach to determine a complex plant polymer’s structure is to dissolve it in solutions with specific chemical compounds that will break it apart into smaller and smaller pieces from which the complete structure can be deduced. But since sporopollenin is inert and does not react with the researchers’ usual cadre of chemicals, figuring out how to break down the molecule was a key challenge. In order to crack this problem — and make the sporopollenin dissolve more easily — Li used a specially designed grinder known as the high-energy ball mill to physically shear the tiny pollen coat into even finer pieces. Then he began testing different chemical mixtures to find ones that could break apart the sporopollenin polymer into more accessible fragments. The big breakthrough came when he tried a chemical degradation process called thioacidolysis, an acid catalyzed reaction with a pinch of a special sulfur-containing compound. This allowed Li to consistently break down 50% of the total sporopollenin polymer into small pieces, with the structure of each of these pieces resolved one by one. To help complete the puzzle, the researchers collaborated with Mei Hong’s group in MIT’s Department of Chemistry and used magic-angle-spinning solid-state NMR spectroscopy, which can determine the chemical structures of insoluble compounds by having them interact with magnetic fields. This investigation narrowed the possible structures for sporopollenin. Combined with more chemical degradation tests to verify certain possibilities and eliminate others, it ultimately led to the complete structure. With the structure of sporopollenin in hand, the researchers were then able to identify aspects of this unique polymer that make it such a good protective wall for spores and pollen. A key finding was that sporopollenin molecules contain two types of cross-linkages, esters and acetals, that act like chemical clips, binding the chains of the molecule together. Other known plant polymers have only one main type of cross-link, and this unique characteristic likely provides the extreme chemical inertness of sporopollenin. Ester bonds are resistant to mildly acidic conditions, while acetals are resistant to basic conditions, meaning the molecule won’t break down in either type of environment in the wild or in the lab. Other components of sporopollenin that the researchers found include multiple molecules known to provide UV protection, as well as fatty acids, which are water resistant and may protect spores and pollen from drought or other changes in water availability. The researchers are now looking for differences in sporopollenin between species. Pine is not a flowering plant, but the majority of plants of interest to agriculture and medicine are, so Weng and Li are investigating how sporopollenin may have changed with the evolution of the flowering plants. This work was supported by the Pew Scholar Program in the Biomedical Sciences and the Searle Scholars Program, and the U.S. Department of Energy (# DE-SC0001090). 1. Whitehead Institute for Biomedical Research, Cambridge, Massachusetts 02142, United States. 2. Department of Chemistry, Massachusetts Institute of Technology, Cambridge, Massachusetts 02139, United States. 3. Department of Biology, Massachusetts Institute of Technology, Cambridge, Massachusetts 02139, United States.